The WISP-3 is an easy to operate hand-held instrument to scan surface water quality. It contains three radiometers that measure the reflectance ('the colour') of the water. From this optical signal it instantly derives the concentrations of water quality indicators such as chlorophyll and suspended matter, without the need for laboratory analyses. A WISP-3 package includes the WISP-3 unit, SD card & cables, the manual, a heavy-duty flightcase and basic access to WISPweb; our measurement portal. We also offer subscription services covering yearly calibration, more features on WISPweb, support, training and extended warranty. Water managers spend a lot of time and resources to obtain accurate water quality monitoring data. This is needed for early detection of possible risks for the ecosystem, or to comply to swimming water regulations. Monitoring is also required for formal reporting, e.g. for the EU-Water Framework Directive. In summer, when the phytoplankton and cyanobacteria bloom, frequent monitoring can be time consuming, while results from laboratory analysis are only available a few days later. The colour of a water body provides valuable information on its contents. Pure deep water looks blue because of the specific shape of the water molecules that absorb almost all light, but reflect mainly blue light. Most algae are green due to the pigment chlorophyll-a, but cyanobacteria ('blue-green algae') have different pigments and therefore another colour. Sediment often reflects a lot of brown/reddish light and colours the water therefore bright brown/red. Dissolved organic material often turns the water yellowish to brown. It absorbs much light, so that the water appears darker. Although the idea is simple, dedicated algorithms are needed to derive concentrations of these substances from the colour of the water. The WISP-3 is developed by Water Insight for quick scanning and monitoring of water quality in water supply reservoirs, swimming water locations, lakes, ditches, rivers and the sea. The WISP-3 can also be used for ground-truthing for optical satellite validation. The WISP-3 contains three hyperspectral radiometers, measuring respectively the downwelling radiance, the upwelling radiance, and the diffuse downwelling irradiance. From the signal of these three radiometers the reflectance ('the colour') of the water can be determined. 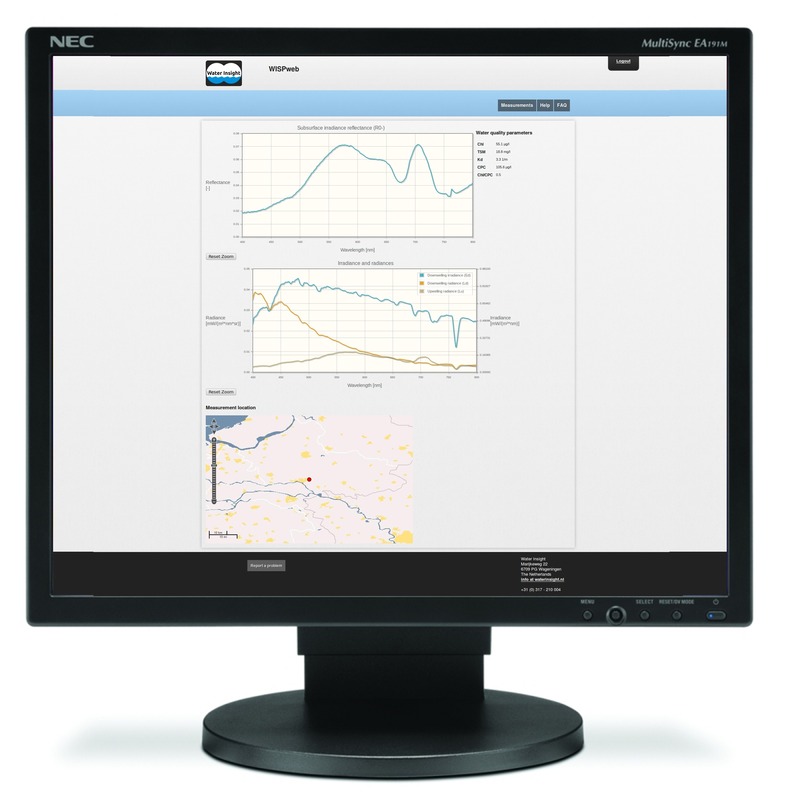 Due to its speed, flexibility and instantaneous data availability, usage of the WISP-3 and its web portal enables day to day decision support systems for water management organizations where algal blooms affect drinking water safety, swimming water safety and/or ecological status of the environment. Compared to laboratory measurements the WISP-3 is fast and flexible. Preliminary data (concentrations and reflectance) is immediately presented in the display; the complete data is available directly after uploading the measurements via the WISPweb system. In WISPweb your WISP­3 measurements are safe: backed up and only visible to you (and selected others if you wish). After upload the measurements are calibrated and several algorithms for water quality parameters (Chlorophyll ­a, Total Suspended Matter, Phycocyanin, and Kd) are applied. WISPweb allows for safe and easy analysis and comparison of measurements. You can even export selected results or spectra for further analysis.